Andalucía - land of contrasts... from the great Moorish monuments, including Granada's Alhambra Palace and Córdoba's Mezquita, a grand and beautiful mosque constructed by the Moors, its unspoilt inland towns and white villages... to the vibe of the modern beach resorts. Hostal Sonia has 24 rooms, all fully renovated and equipped with all the amenities you need to make your stay pleasant: telephone, air conditioning, heating, wifi. A family run hostel located in the historical and monumental center of Granada, located in the most important shopping and entertainment area of the city of Granada. From our privileged position, guests can visit the Alhambra, Generalife, the Cathedral, the Royal Chapel and the Alcaizería. Also famous neighborhoods as the Albayzin, declared a World Heritage Site or the commercial center of Granada. 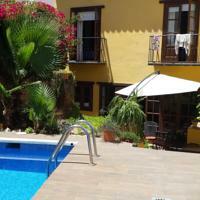 Hostal Azahara is situated in the beautiful town of Nerja on the Costa Del Sol, within easy reach of wonderful beaches and restaurants and the Balcon De Europe and beach are only a 10 minute walk away. The bustling nightlife and coastline are within walking distance when you stay at the welcoming family run Hostal Azahara. Low cost, good value accommodation - all rooms en suite with fridge, kettle, TV. Bar, breakfast and internet facility available. 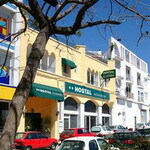 Hostal Lorca is a small hotel in Nerja, one of the nicest towns on the Spanish south coast in Andalucia (Costa del Sol). 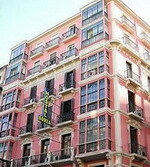 The hostal was built in 2000 and decorated in a rustical style. It has an attractive interior, small pool and a private backyard to sunbathe. In addition, there is a bar where you can relax, watch TV, play a game, read, etc. Breakfast and cold drinks are available.You can make your own tea/coffee and even can use the microwave/plates/cups etc. - a home from home. The beach is +/- 600 meters away.